Coaching with Meaning and Spirituality aims to help coaches with those occasions where a clients’ search for meaning needs to be addressed and explored. 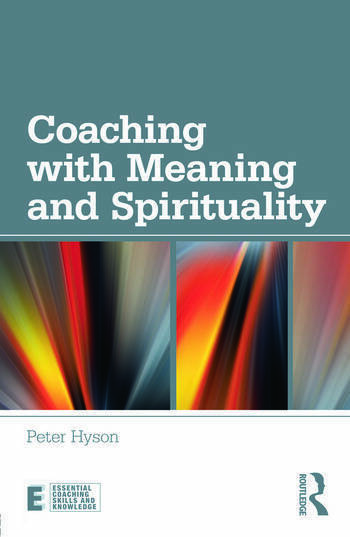 Working with spirituality in a coaching context can be difficult and unfamiliar for coaches, but in this book Peter Hyson provides a vocabulary to facilitate this exploration, and ultimately to help coaches to address their clients’ doubts and worries, especially in an economic climate where old certainties may be lost. Part I of this text argues the case for why coaches should be willing and able to explore areas of meaning and spirituality with coachees. It provides definitions and terminology. Part II uses case studies and activities to help coaches apply these definitions to specific contexts that we might face as coaches. The final part provides some deeper skill-development and extended resources. This book looks at motivation; legacy; drive to succeed; increasing profit; maintaining work-life balance; stress, breakdown and crises; and qualities of effective leadership. It will be especially useful for professional coaches, both the experienced and the relatively new, who coach in a variety of contexts. It aims to stimulate a new area of discussion across the wider coaching profession. Preface; What's missing? ; Meaning and spirituality; Spirituality and work-life balance; Spirituality and crises; Spirituality and business; Developing the coach's skills; Additional resources; Postscript - biography of a Cheshire cat. Peter Hyson has followed careers ranging from swimming coach and teacher to TV producer and business coach. He has a Master's degree in Leadership Development and Managing Change, and professional membership of the Association for Coaching and the European Mentoring and Coaching Council. Hyson has worked with senior leaders in the City, charities and voluntary sectors, and is also a member of the Professional Speaking Association.